South Africa's Basic Education Department has been in court this week, accused of failing to deliver textbooks to schoolchildren in the northern Limpopo province. The issue has developed into an embarrassing scandal for the governing African National Congress, involving allegations of mismanagement and corruption, as the BBC's Rob Walker reports. Mrs Manaka's maths class are struggling with a problem - how to calculate daily profits from a busy car wash.
She jots down a formula on the board and pupils begin to shout out their answers. Since lessons started in January, students at Tlakulani Secondary School have also been wrestling with another, much bigger problem - how to study without the new textbooks the government was supposed to provide. "Many times, we ordered the books but they didn't deliver. 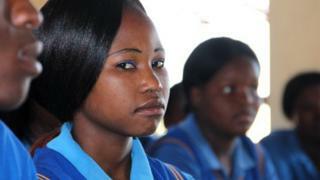 We reminded them, we keep on ordering the textbooks, and they still didn't deliver," says Mrs Manaka. She fears results will nose-dive in the fast approaching end-of-year exams. Limpopo province, one of the poorest in South Africa, already has some of the worst performing schools in the country. Yet despite an education budget of 22bn rand ($2.6bn; £1.6bn), the ANC-led provincial government has failed to provide any textbooks for this year. Many parents are furious, particularly because some grades are studying a new curriculum this year. South Africa spends 6.1% of its GDP on education, a bigger chunk than most other countries, yet its results are among the worst. In the World Economic Forum's latest Global Competitive Index it ranks bottom (out of 133 countries) in both maths and science education. In the 2006 Progress in International Reading and Literacy Study it also came bottom (out of 40 countries), as it did in the 2003 Trends in International Maths and Science Study (out of 48 countries). At the top, South African students do as well as anyone, but the great majority are performing way below their capabilities. "They promised us better education. They campaigned and told us your vote is your voice. Now there is nothing," said Tondani Lydia Masiphephethu, who has three children in Limpopo state schools. Earlier this year, she joined forces with Section 27, a South African NGO, and took the national Department of Basic Education to court to demand it provide textbooks. "In the speech of the president, he announced billions to the department of education. Where is the money?" she asks. The answer to that question shines a light on a problem much wider than Limpopo. Two years ago, Limpopo's education department decided to contract out the procurement and distribution of textbooks. A company called EduSolutions, which operates large state contracts in other provinces, won the bid. But it was soon clear that privatisation meant books would cost the state much more than before. "They wanted a way to corrupt the system, and the only way is when you bring in a middle-man," said Solly Tshitangano, a senior education official at the time of the deal. He says politicians and officials decided to outsource textbook supply solely in order to find a new way to defraud the taxpayer. "This was just the tip of the iceberg. It was not the only deal that was taking money away from the government." Mr Tshitangano was sacked by Limpopo's government last year for gross insubordination and gross negligence. He says it was because he had blown the whistle on the EduSolutions deal and other questionable tenders. By the end of last year, Limpopo's education department had run out of money, before it had ordered any textbooks for 2012. It had racked up an astonishing $250m in unauthorised expenditure and was no longer able to pay salaries. In December, the central government was forced to intervene, taking over education, and four other departments. Once the National Treasury got a look at the books, information began to emerge about tenders which had been awarded without competition, and which appeared to have been manipulated to increase their value. Details of the EduSolutions deal were particularly disturbing. "Having EduSolutions there you had inflated pricing and we didn't have control over the procurement of those books, and we couldn't negotiate discounts," says Kenneth Brown, deputy director general in the National Treasury. Central government cancelled the contract with EduSolutions earlier this year, and Mr Brown says, saved a huge amount of money in the process. "We procured the same amount of books at just 10% of what government would have paid [to EduSolutions]," he says. The Special Investigating Unit - the state body responsible for fighting corruption - is now examining the textbook deal. EduSolutions told the BBC it prides itself on good governance. It said the tender had followed government procurement procedures and that book prices were set by the education department and the publishers. "It is therefore baseless and far from the truth to suggest that the deal with EduSolutions meant inflated prices/ pricing," the company said in a statement. Pat Kgomo, the spokesman for Limpopo's education department, maintained that correct procedure had been followed in awarding the contract to EduSolutions and said in a statement that the allegation the tender was designed to benefit politicians and officials was "false and malicious". The national Department of Basic Education took over the functions of the provincial department in December. Its spokesman, Panyaza Lesufi, accepts there have been serious failings in Limpopo, but says that these are now being addressed by the national government. "You've got bad apples that are doing things that are not correct in terms of tenders, but that does not mean the entire system has collapsed - that's a wrong, misleading view." But government critics say the problems go much wider than the failure to deliver textbooks. "Senior political leaders in the province in their majority are 'tenderpreneurs'," is the blunt assessment of Dan Sebabi, the head of Limpopo's branch of Cosatu, the coalition of trade unions that is in alliance with the ANC. "They are doing business with the same government institutions they are leading. They are awarding themselves tenders." Mr Sebabi believes the ANC politicians who run Limpopo have betrayed the people they are supposed to represent. "They are spitting in the faces of the poor. Our people see these things and their anger is growing by the day." Many other local governments have faced similar accusations. According to South Africa's auditor general, only seven out of 237 South African cities received clean audit reports for 2010. As end-of-year exams approach, some schools in Limpopo are still waiting for books. Parent Tondani Lydia Masiphephethu is furious. "They're just eating money, and my problem is the politicians' children are not in our schools. Most of them send their children outside the country, to study in foreign schools." Rob Walker's Assignment will be broadcast on the BBC World Service on 4 October 2012. Listen to the Assignment via iplayer or browse the documentary podcast archive.